Craft Bioglitter® is a new innovation in kindergarten and primary education level children’s glitter. A new glitter produced from materials that addresses the environmental micro plastic issues associated with plastic glitter. Craft Bioglitter® is specifically developed and formulated to perform in simple sprinkling and glueing applications in nurseries, primary schools or at home. Craft Bioglitter®; setting new standards in glitter effect products for children. 87% biodegradation achieved in 28 days. Only 3% off meeting the performance criteria required for certification. As we remove the last of the plastic, biodegradability performance will increase allowing us to achieve our certification goal. Already 92% plastic free and we are working to remove the last bit of plastic to become totally plastic free. 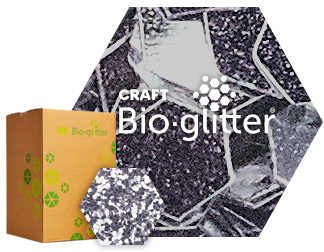 This will improve the biodegradability performance, allowing Craft Bioglitter® to become certified as Cosmetic Bioglitter® PURE already is.